I'm constantly amazed by the awesome things my colleagues are doing. It just goes to show that even graduate students can make really neat cutting edge discoveries in Astrophysics. The most recent star (haha... no pun intended) in our department is Jackie Radigan, a 5th-year PhD student working with Ray Jayawardhana. She studies weather on brown dwarfs, which are essentially failed stars, and has recently made some interesting discoveries, which you can read about here and here. Brown dwarfs are astronomical objects that bridge the gap between massive gas giants, such as Jupiter, and the smallest stars. They range from about 13 to 80 times the mass of Jupiter, and though they form in the same way as regular stars, where big clouds of gas collapse under the force of gravity into spheres, they are too small to fuse hydrogen into helium. When they first form, they can be almost as bright as real stars, but as they age, the heat from their formation dissipates and they become fainter and fainter. Because brown dwarfs are so faint, they're extremely difficult to detect and so the first one was only discovered in 1988. If you want to learn more, you can look into basic or advanced online astronomy classes. Several of these objects have been discovered since, using large all-sky surveys that explore light in the near-infrared such as 2MASS. 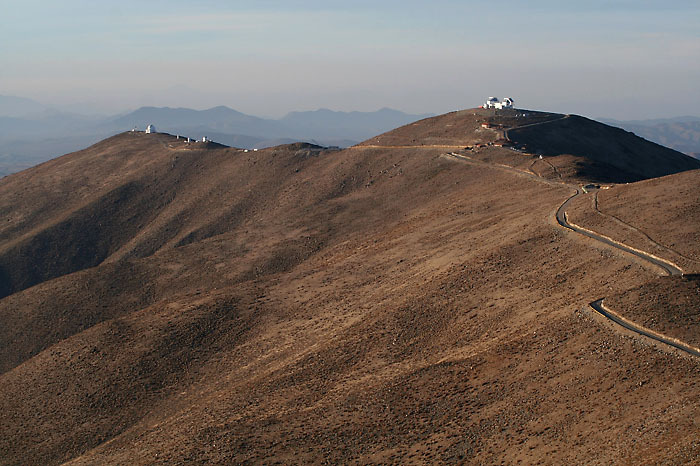 Jackie herself has been using the DuPont 2.5-m telescope located at Las Campanas Observatory in the Atacama desert in Chile (pictured above). I'm a little bit envious that she gets to travel to this gorgeous location (since the furthest I've ever been sent on the school's dime is to Milwaukee for a conference... I should write about that sometime). Turns out that that this observatory is also where University of Toronto prof. Ian Shelton made the discovery of the famous Supernova 1987A. That's an interesting connection. Anyway, as she tells it, Jackie was sitting in the airport on her way to Chile when she got an email from one of her collaborators with a plot showing a 30% change in brightness over 8 hours of the brown dwarf 2MASS 2139, which is approximately 47 light-years away. This variation is about 10 times larger than one would expect from magnetic features such as sunspots. She and her collaborators think that this change is due to a huge storm on the surface of the brown dwarf that blocks out some of the light coming from the brown dwarf's surface, something like a supercharged version of Jupiter's Great Red Spot (pictured above). The change in brightness comes about as the brown dwarf rotates on its own axis. With more detailed observations, that is, with higher resolution and a broader frequency range, they'll be able to make sure that their model is correct. It will be very interesting to see what sort of follow-up results Jackie and her collaborators come up with over the next several months. A paper about this research will be submitted to the Astrophysical Journal very soon, but you can read her preliminary article here.